ED029TC1 display is E Ink - black-white industrial e-paper module that has 296x128 resolution and 112dpi. 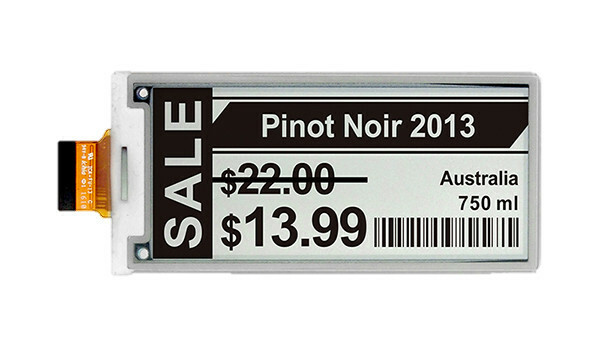 E Ink is renowned from producing top quality e-paper displays. The company is one of the largest and most recognized EPD manufacturers in the world, and a pioneer in the development of electronic ink (E Ink) technology. Products created within the revolutionary E Ink technology are readable in direct sunlight and do not need backlight or electricity to sustain the image. In addition, they characterize by high contrast, low power consumption and thin and light form. These solutions are used in the industrial and consumer applications market to create products such as e-book readers, electronic money, smart watches, digital signage, or banners. EPD displays do not have a liquid-crystal matrix which limits the viewing angles to a certain extent. Thanks to the technology used (adjustable capsules with multi-color ink), e-paper makes the illusion that the content is printed on its surface. Watching EPD at any angle is virtually no different than viewing printed sheet of paper. EPD (Electronic Paper Display) technology is defined as bistable. This means that each e-paper matrix cell may occur in one of two available states and no electrical energy is required to maintain displayed content, e.g. cells in black-and-white display arrange in a way to display black (state ‘0’) or white (state ‘1’) color. Energy is only needed to change the cells position, simplifying - to change the display image. Thanks to this feature, EPD technology is a perfect solution in applications where content is changed relatively rarely (e.g. e-prices, e-timetables, e-readers, smart watches and more). Exceptionally low power consumption of e-paper displays in comparison to standard LCD TFT modules results from the two characteristics of this technology. Firstly, EPD (Electronic Paper Display) does not require backlight what significantly reduces energy consumption. Secondly, e-paper consumes electricity only when changing the displayed content. It is a significant advantage over LCDs (the displayed content needs a continuous power supply in order to be visible) when it comes to energy efficiency. E-paper displays, like the real paper, are perfectly legible in the sunlight. This property is due to their design and applied technology. The EPD (Electronic Paper Display) is a reflective display which means that it reflects light from the environment. The brighter the exterior, the more clearly the human eye perceives the displayed content. It can be assumed that if the image on standard paper is readable under the lighting conditions, then on e-paper also. EPD (Electronic Paper Display) technology does not require backlight. This feature affects the thickness of the entire module - in some models it is even less than 1 mm. Modern ultrathin displays are much more convenient and versatile in design and assembly, providing a result consistent with the latest industrial design and trends.